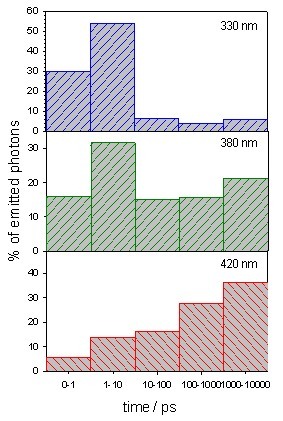 Percentage of the total emitted photons by poly(dA).poly(dT) at a given wavelength as a function of the time window. The study of excited states and energy transfer in DNA double helices has recently gained new interest connected to the development of computational techniques and that of femtosecond spectroscopy. The present article points out contentious questions regarding the nature of the excited states and the occurrence of energy transfer and shows how they are currently approached. Using as example the polymer poly(dA).poly(dT), composed of about 2000 adenine-thymine pairs, a model is proposed on the basis of time-resolved measurements (fluorescence decays, fluorescence anisotropy decays and fluorescence spectra, obtained with femtosecond resolution), associated to steady-state spectra. According to this qualitative model, excitation at 267 nm populates excited states that are delocalized over a few bases (excitons). Ultrafast internal conversion directs the excited state population to the lower part of the exciton band giving rise to fluorescence. Questions needing further investigations, both theoretical and experimental, are underlined with particular emphasis on delicate points related to the complexity and the plasticity of these systems.